Rajiv Hari Om Bhatia, better known as Akshay Kumar (born on September 9, 1967), is one of the most dashing actors of Bollywood. Hailing from the Indian state of Punjab, Akshay has been known for his dancing skills since his younger days. Throughout his illustrious acting career, Kumar has acted in romantic, action, and comic roles, startling us with each of his mesmerizing performances. ‘Akki’ or ‘Khiladi’ as he is popularly called, Akshay Kumar has always been obsessed with workouts. The action star of Bollywood is a fitness freak, and his passion for training and workouts is still strong at 48. The flamboyant actor with his fit and ripped physique is an expert in different forms of martial arts such as Taekwondo and Muay Thai. Undoubtedly, he is one of the most famous fitness icons of today’s youth. 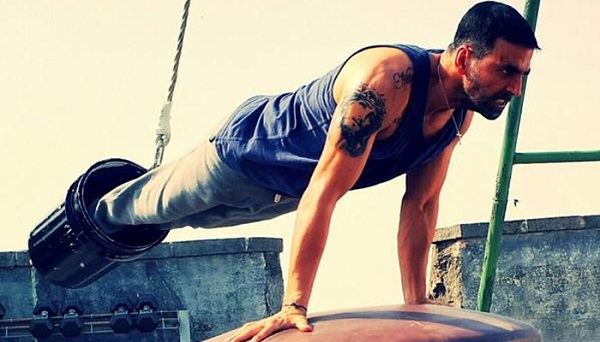 Akshay opts for the kind of diet that his body needs. He leads a disciplined life, refraining from cigarettes and alcohol, rising early in the morning, taking his dinner before 7pm and hitting the bed before 9pm. The charismatic actor typically eats 4-5 meals a day and banks on fresh, homemade foods to provide him the right mix of proteins, carbohydrates, and fat. Instead of using dietary supplements such as artificial enhancers, powders, and shakes, Kumar prefers having wholesome, nutrient-packed foods. 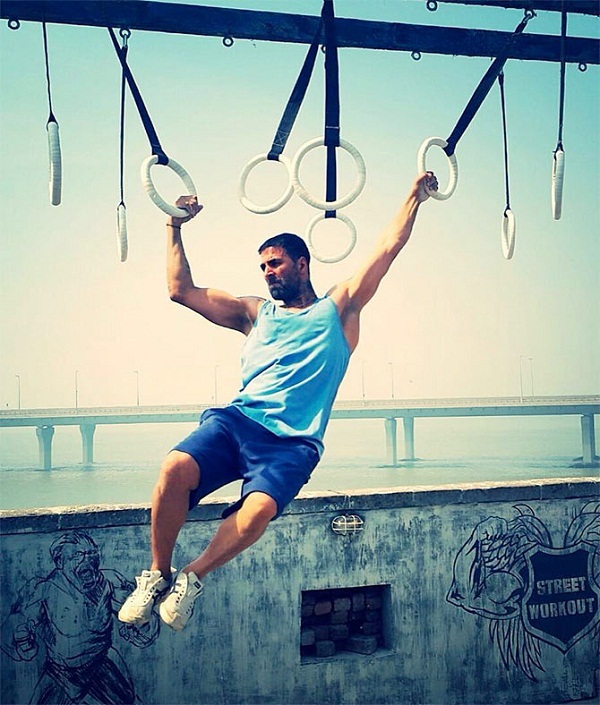 Unlike most Bollywood stars, Akshay does not train under the supervision of any fitness instructor. Being well aware of his exercise requirements, he trains on his own to keep his body fit and healthy. While he may hit the gym regularly, he does not like to follow a predefined set of exercises, changing them according to his convenience. He does not train for achieving a six-pack or eight-pack abs; instead, he focuses on the natural ways of staying hale and hearty. When it comes to his workout routine, Akshay starts his day at 4:30 in the morning by warming up with a long, fast-paced walk. Then he practices shadow boxing and kickboxing for an hour. He performs yoga and meditation after a set of strenuous exercises. Moreover, he does an array of cardio workouts including running, hiking, swimming, and stair climbing. In the gym, he concentrates on doing regular workouts that strengthen and condition his core muscles. He plays basketball every week to enhance his stamina and agility.